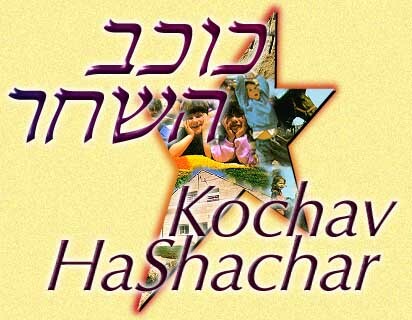 Kochav Hashachar is a national-religious community of 300 families, comprising Kochav Hashachar itself, Maaleh Shlomo and Mitspe Kramim within the jurisdiction of the Mateh Binyamin Regional Council. Resident population is over 1,500 people. Current plans call for expansion to at least 550 families. 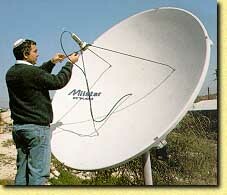 Kochav Hashachar is located on the "Allon Road" some 18 miles North of Downtown Jerusalem. The yishuv is situated toward the Eastern edge of the Judea-Samaria Mountain Range, overlooking the Jordan Valley. Commuting time to Downtown Jerusalem is approximately 30 minutes (up to one hour during the morning and evening rush hours). Travel to Downtown Tel Aviv (approx. 1 hour) takes you past Modiin (30 minutes) via Route 443. The commute to North Tel Aviv and its Northern suburbs is via the Trans-Samaria highway; approximate travel time is also 1 hour from the yishuv. The yishuv has a modern day care center, nursery schools, kindergardens and an Elementary School for Grades 1-6. (The Israeli educational system has Elementary School, Junior High and High School as three separate units). There is also a "Barkai" elementary school in nearby Michmas which has a sizeable attendance from the yishuv. Kochav Hashachar teenagers attend yeshiva high schools and ulpanot across the country. Along with the many after-school enrichment programs ("chugim") available for children, the yishuv sponsors a Talmud Torah for all ages to enhance Torah study and appreciation. The Ezra youth movement maintains both boys and girls branches on the yishuv. There is a Kupat Cholim Leumit medical center on the yishuv, with attending general practitioners and pediatricians. Specialists, particularly OB/GYN, are also available on a frequent basis. There are two attending nurses and Tipat Chalav services for infant and early childhood immunizations. Additionally, there are currently four doctors, three midwives, numerous nurses and paramedics who live on the yishuv, who are all ready, able and willing to assist in emergency situations. The yishuv is equipped for emergency procedures, with the ambulance crew serving on the first response team for the entire area. Kochav Hashachar also benefits from a dental clinic run by Dr. Shai Lev-Tzion, hailing from Queens, New York. In addition to the numerous green areas, playgrounds and basketball courts, a nearly Olympic sized swimming pool with separate hours is located five minutes away in neighboring Rimonim. An Activity Center serves many arts and music activities for children and plans are being drawn up for a Community Center (Matnas). The yishuv's Cultural Committee sponsors community-wide events on major holidays, including plays, guest lecturers, concerts, comedians and ceremonies on special occasions including IDF Memorial Day and the anniversary of the town's founding. The brand new Rennert Synagogue complex is the center of community activity. Dedicated by Ira and Ingeborg Rennert of New York in January 1998, the building houses both the Ashkenazi and Sefardi shuls. On weekdays there are four minyanim for shacharit (5:45, 6:15, 6:45 and 8:00), two for mincha and three for maariv. On Shabbat mornings there are three minyanim at 7:30, 8:00 and 8:45. There are 2 mikvah facilities (for men and women, respectively) with all necessary amenities. Regularly scheduled shiurim take place virtually every night of the week, for all segments of the population, as well as a morning study program for women. Many people can be found in the Beit Knesset in the evenings studying b'chavruta. There are 2 shiurim on the Daf Hayomi, one before Maariv and one following. Rav Yonatan Elran, who studied at the Merkaz Harav Yeshiva in Jerusalem serves as Rav of Kochav Hashachar. He is available for consultation on both halachik and personal issues. Rav Elran also teaches at the prestigious Horev School in Jerusalem. Our own Tzemach Hirschfeld serves as mohel for the entire region and is certified by the Chief Rabbinate and the Ministry of Health. Kochav Hashachar has a Mini-Supermarket (more than a makolet, but not quite Supersol - yet) that is open every day of the week offering a full range of products. Adjacent to the Mini-Supermarket are a slew of storefronts including a Post Office and Ofnat HaKochav, which carries clothing, gifts and toys. The yishuv is home to 2 accounting firms, to Milstar Electronics, 2 carpentry shops, a number of sofrei-stam, two food-catering services, and some of the most sought-after Hadassim in the country. Some families devote a portion of their time to agricultural work on adjacent land, immersing themselves in the Mitzvot Hatluyot Baartez. The grapes grown in Kochav Hashachar are purchased every year by Carmel Mizrachi for their red Fantasia Sparkling Wine. Kochav Hashachar also has its share of lawyers, insurance agents, a large number of computer professionals, doctors, nurses and educators. OK, you say. Sounds great. Click here to find out about the Klita process and how to get started with your move to Kochav Hashachar.